The Crook County Cowgirls golf squad has a lot of work ahead of them should they hope to reach the state tournament. The Cowgirls return just three players off of last year's squad, which finished fourth at their Class 4A regional tournament. Those players, Jaylyn Smith, Sammi Todd and Kaiya Eller, will be expected to lead the team this year. "Sammi and Jaylyn were in my top three last year and then Kaiya, especially towards the end of the year, had some really good scores," Crook County head coach Sarah Shinkle said. "The rest of the girls really want to be there, and they are trying hard. They are getting lessons and things like that, so I think that all of them are working really hard, too." Macy Goehring, the team's lone representative at last year's state tournament, has graduated. Making the task of reaching the state tournament even more daunting, the Cowgirls move up to Class 5A this year, and the OSAA has reduced the number of 5A schools which qualify for the state tournament. In 2018, Class 5A qualified eight schools for the state tournament. This year, the Intermountain Conference and the Northwest Conference have been combined into one district, leaving Class 5A with just six teams qualifying for the state tournament. "They combined us and another league, which no other leagues have to combine in 5A," Shinkle said. "We don't know how many full teams they have, so it could potentially be where there are 12 to 14 teams vying for two spots at state." Shinkle said that all six Intermountain Conference schools have full teams of golfers. Of those teams, Pendleton is the team to watch for as they placed fifth at last year's state tournament and have their entire team returning. That fifth-place finish looks even better when you consider that Bend and Summit, who finished first and second a year ago, have moved up to Class 6A. Crater and Crescent Valley finished third and fourth at last year's state tournament and should be strong again, but unlike Pendleton, they both lost some players to graduation. The remainder of the Intermountain Conference, which includes Hood River Valley, The Dalles, Ridgeview and Redmond, should also be solid teams. The Northwest Conference is more of an unknown quantity. That league consists of Hillsboro, La Salle Prep, Milwaukie, Parkrose, Putnam, Scappoose, St. Helens and Wilsonville. Last year, Wilsonville and La Salle Prep represented the league at state, while Scappoose qualified for state at the Class 4A level. Weather has also impacted the Crook County season. With heavy snowfall just before the start of the spring sports season, the Cowgirls canceled the first week of practice. The second week of practice was spent indoors going over rule changes, and it wasn't until week three that the team finally had any chance to go outside. "We were practicing inside for a while," Shinkle said. "We've gone over a bunch of the rules, especially the new rules coming out. Some of them are a little more friendly, and some of them are a little bit more difficult to remember. Going over those has been good for all the players." Shinkle added that the practice difficulties have left the Cowgirls behind where she would like them to be. "We had to cancel three tournaments, but then everybody in Central Oregon did," she said. "We are a little behind compared to where we normally are, but our first official varsity tournament isn't until Friday, April 5 now, so we still have some time." Not only have several tournaments been canceled, the rest of the season schedule has also changed as several courses in Central Oregon are not expected to be playable until at least the middle of April. As a result, Shinkle said that the team will end up playing tournaments on courses that they don't normally play. "Some of the Bend courses may not be playable for some time still," she said. "So we are having to play some courses that maybe we don't play all the time just because of the weather, so that will be interesting." Shinkle added that although the team is behind, they are all working hard and things are going well. "Now that we are on grass, everything has been really good," she said. "We've played, we've practiced and we've gone over a bunch of the rules and everyone is working hard." Although Shinkle knows that the move up to Class 5A is going to have an impact, she is also optimistic. "I'm excited that we are going back to Quail Valley for state, because my girls know Quail Valley and they like it," she said. "They have done pretty well at it." Adding to the optimism, the state qualifying tournament will be held at Meadow Lakes, giving Crook County a home course advantage. The April 5 tournament will be a big day for the Cowgirls. Not only will it be their first tournament of the year, it is also going to be a league event, giving the team an opportunity to see all of the teams in the Intermountain Conference for the first time. 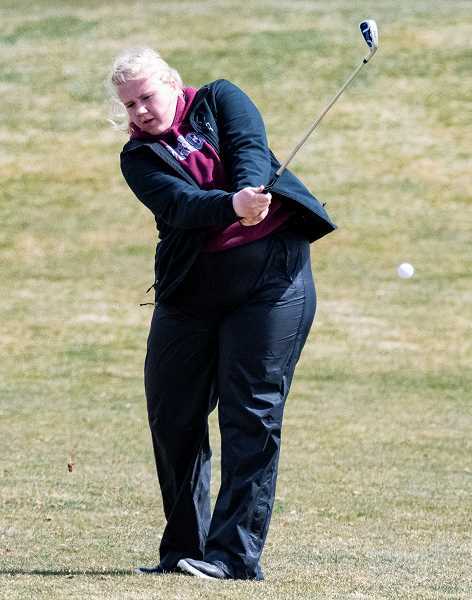 The tournament, which will be held at Eagle Crest Resort, is scheduled to begin at noon, while the district tournament is set for Monday and Tuesday, May 6-7 in Prineville. "I'm just excited to finally start playing golf now," Shinkle said.